As the chief executive and co-founder of the ballet barre studio chain Physique 57 and a mother of three, Jennifer Vaughan Maanavi has a full schedule. A former Morgan Stanley employee, she now oversees nine Physique 57 locations, from Bangkok to New York, in addition to attending her children’s soccer games and ballet classes and fitting in a few date nights with her husband. 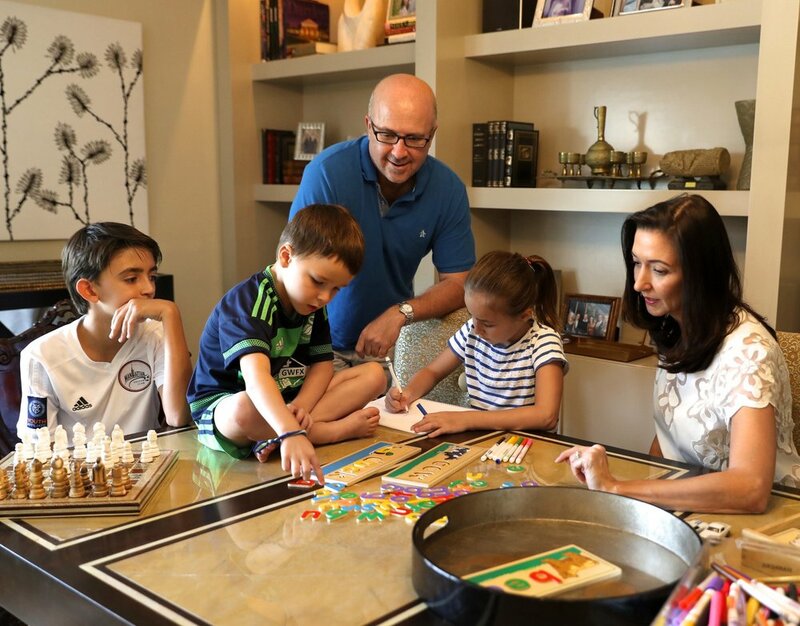 Ms. Maanavi, 45, lives in an Upper East Side apartment with her husband, Dar Maanavi, 50, who works in trade finance and commodities, and their children, Alec, 12, Halle, 7, and Cameron, 4. DUBAI TIME I am awake and ready to go at 6:30 a.m. I have three children, so sleeping in on the weekends is not an option. Plus, it is easier to get up early in order to plan the day, and week for that matter. Our Sunday is Dubai’s Monday (their workweek is Sunday through Thursday), so I usually check in with our studios there first thing in the morning. They are growing very quickly, and we usually have quite a lot of business to discuss. PREPARE TO PLIÉ At 8, I take a class at our 57th Street location. I feel so much better when I start or finish a weekend day, or any day for that matter, with a workout. The best part of weekend workouts is that I can spend some extra time connecting with various teams. If I am really lucky, I bring Alec, my 12-year-old son, to the studio with me. Since he was 8, he has been pitching in and loves putting our clients’ weights back in their bins. THE RUNAROUND After picking up a venti green tea from Starbucks and healthy egg sandwiches for my husband and children at Fresh&co, I head home so the activities can begin. Mixed martial arts for Cameron, ballet for Halle and soccer or basketball for Alec. Hustle and bustle for a solid three to four hours. If we’re lucky, about once a month we find a golden half-hour of free time to run across the street to the Met to check out the new exhibits. We really love the costume exhibit every year. ME TIME After trekking through Manhattan for so many hours, I need just 15 minutes to myself. I go into my room for quiet time, and 15 minutes is all I need. I meditate or try to sleep. This is totally refreshing, and usually my family doesn’t even know I’m gone. SUNDAY DRIVE One of my favorite family times on Sunday is actually running errands because it’s also our version of a Sunday drive. Whether it’s stopping at Whole Foods to stock up on healthy food for the week, making our monthly drop off at Goodwill Industries of the children’s outgrown clothing or giving old toys to the Inwood House, an amazing charity that cares for pregnant and parenting teenagers, we are together and having fun. No matter what, we love listening to music and must play “Jessie’s Girl” at least once for Cameron. OFF TO THE PARK In the afternoon we head to Central Park with the children. We live across the street, so the park is basically our backyard. We meet up with some other Dalton or All Souls families and let the kids run loose. I can also use this time to catch up with my professional network, such as YPO friends. I love to meet with upstarts in the consumer retail or fitness arena. The Columbia University entrepreneur network is thriving, and I offer my time as often as I can. Around this time I am also ordering green juice or a mint chip smoothie from Juice Press. They use Postmates for delivery and will find you anywhere, even at the playground. It’s a miracle service. DEVELOPING PALATES We head out for family dinner. We like to introduce new cuisines to the children, anything from Thai to Indian or Japanese. Our 12-year-old is much more game than our 4-year-old, but we keep trying. ALL BUSINESS After the kids are bathed and asleep, it is back to work for me. At night I check on all of the studio numbers and also start returning other international correspondence. Bangkok is opening its second location, and I plan to bring the entire family there for the opening. This is also when I catch up on personal email, as well as plan out the calendar for the week. My husband, Dar, and I wind down with some cherished quiet time. I love Harvard Business Review and try to read at least one article a week. Right now I am also reading “The Endangered Customer,” by Richard Shapiro.